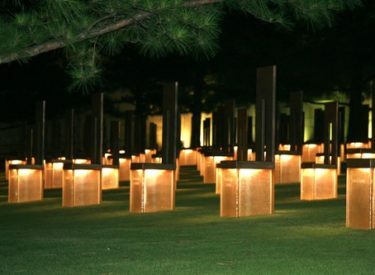 More than 300 people gathered at the Oklahoma City National Memorial & Museum to mark the 16th anniversary of the April 19, 1995, bombing of the Oklahoma City federal building that killed 168 people. Antonio Cooper Sr. walked across a field of empty chairs that represent the bombing victims and strapped a colorful bouquet of flowers on the one dedicated to his 6-month-old son, Antonio Cooper Jr. The child was attending daycare in the building. Cooper said Tuesday he has tried to move forward in the past 16 years, but he still wonders what could have been if his son had lived. Gov. Mary Fallin says the memorial is a testament to the sacrifices of those killed and injured and it’s important they are not forgotten.